You got that right, you may have seen my Salvadorean Beef Enchiladas that I made with Club House Taco with Chipotle Skillet Sauce, you saw that it was packed with flavor and it was easy. Well, I was craving a little Asian flavor and Club House had me covered. With the coming of fall, it’s the perfect time to have hearty dishes to warm up to. Meals that stick to your ribs and are savory too. I have to be frank and quite honest in saying that now that I have been able to try these sauces, I am going to continue to buy them. They make cooking so much easier, the sauces add a flavourful twist in under 30 minutes and with that, I’m sold. All you need is to defrost your chicken the night before and you’re golden for the prep the next day. I used yellow and red peppers and green beans. Wash and chop the peppers and put them aside. 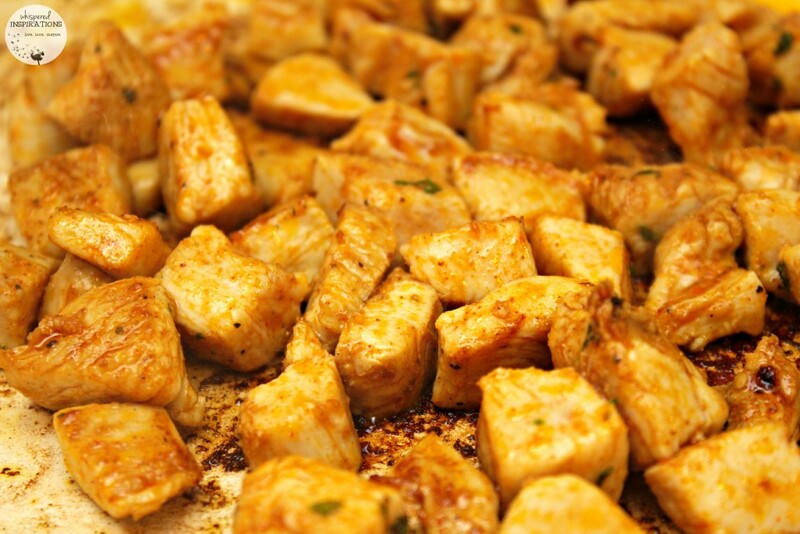 Chop the chicken into cubes and place in frying pan to brown, I used 2 TBSP of olive oil and garlic. The prep is super simple and takes minutes. As for the rice, if you have a rice cooker, then you’re all set. 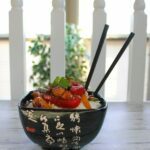 You can also boil it while you cook your stir-fry or buy the instant jasmine rice! Just Tear, Pour and Enjoy! It’s as easy as that, once the chicken is browned, you add the veggies. The veggies cooked on low heat and I covered them with a plate so they can steam. 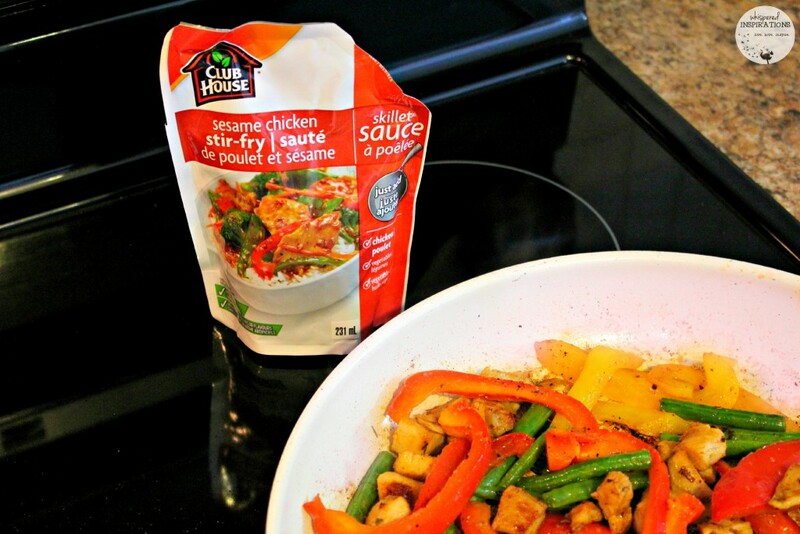 Once the veggies were to our liking, the Club House Sesame Chicken Stir-Fry Skillet Sauce was poured onto the stir-fry! Just make sure to cover evenly and let it simmer! 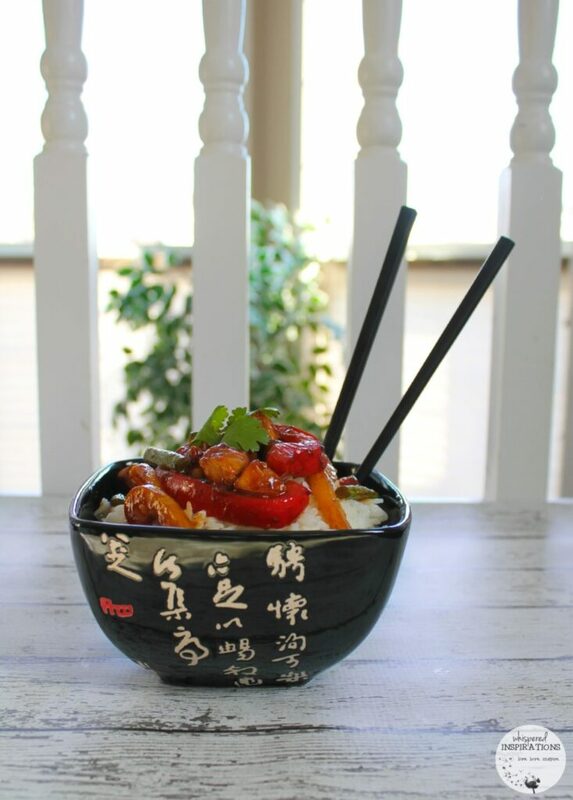 What better way to enjoy stir-fry than atop a delicious bed of jasmine rice. It’s synonymous actually! This was an absolute hit, the girls loved the tangy flavor of the sauce, the chicken was tender and the rice soft. It was a delicious and warm meal in 30 minutes, you really cannot go wrong. Hubby even took some to work because he loved it that much. He told me, “We are definitely stocking up on these sauces!” and I agree! 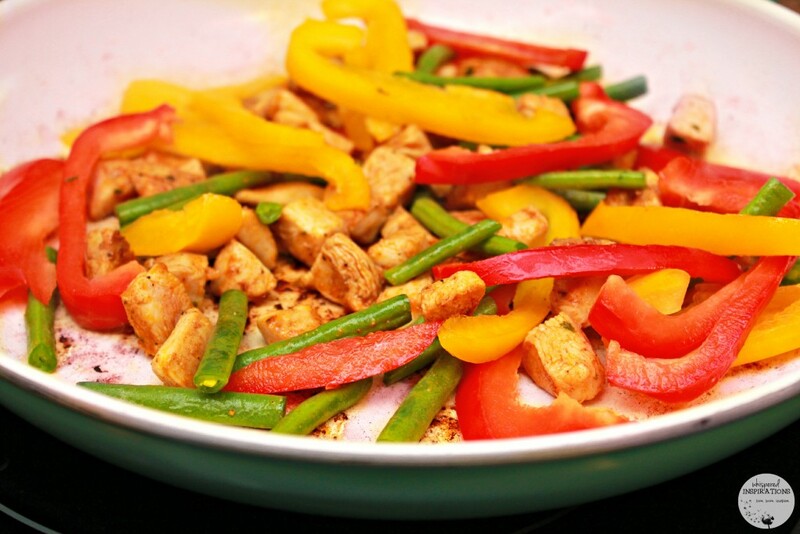 A super simple and delicious stir-fry in 30 minutes! Boil or microwave your jasmine rice. Cut and cube chicken to desired size. Spice chicken with salt, pepper, garlic, paprika and parsley. Warm 2 TBSP of Olive Oil in pan or wok. Place in pan or wok and cook until golden brown. 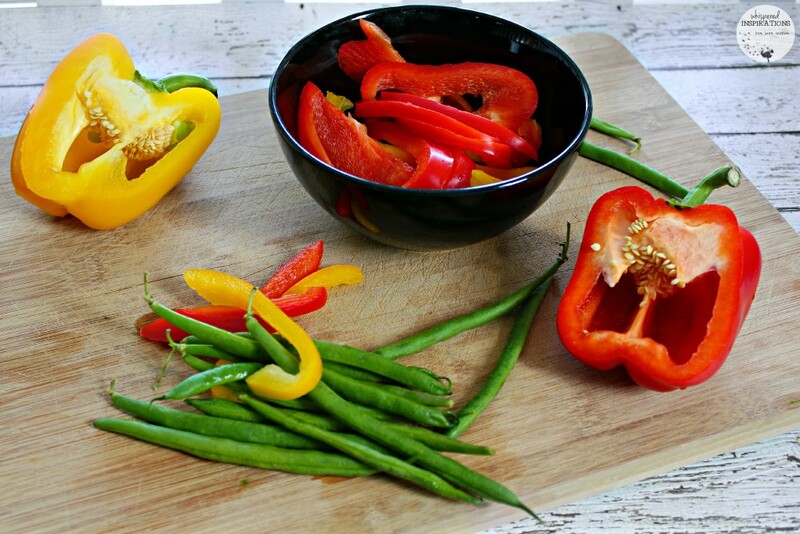 Add cut veggies into your pan and wok and cook until desired. Cover with a plate on low heat to allow steaming. 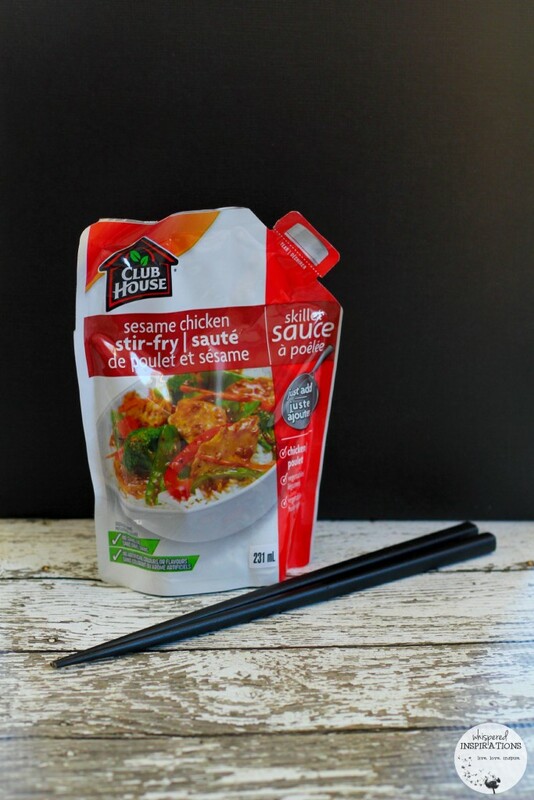 Uncover, stir and pour the ClubHouse Sesame Chicken Skillet Sauce onto contents. Add hot red pepper flakes if desired. Stir thoroughly and until completely covered, let it simmer and take off heat. Meal times have always been a challenge for me. Both my husband and I cook at home and keeping it fresh and keeping it savory can often be something we struggle with. It’s hard to keep things exciting, not boring. But, it isn’t impossible. I am excited to try more of the Club House Skillet Sauces in our weekday menu. Try new recipes and make our old favourites, POP! 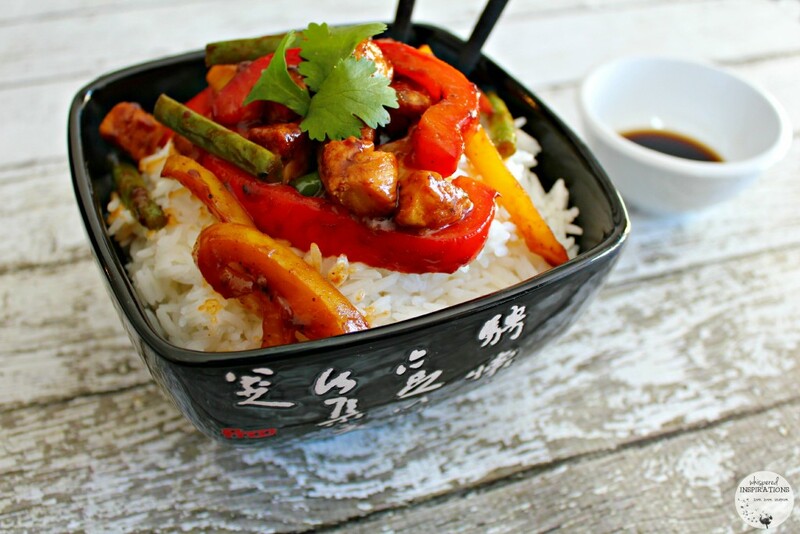 This sesame chicken stir-fry is now a family favorite. With flavours like Fajita with Roasted Chili, Chili with Roasted Garlic, Sesame Chicken Stir-Fry, Sicilian Chicken with Tomato & Herbs, BBQ Chicken with Applewood Flavour and Bacon Sweet & Smoky Sloppy Joes and Taco with Chipotle Skillet Sauces–you have options! If you’re looking for the perfect fall recipe, you’ve found it here! Especially if you want to turn up the heat and sizzle up your Fall Mexican meal nights, check out these Salvadorean Beef Enchiladas! Be sure to head over to Flavour.ca and see what Club House has cooked up and for even more recipe inspiration. 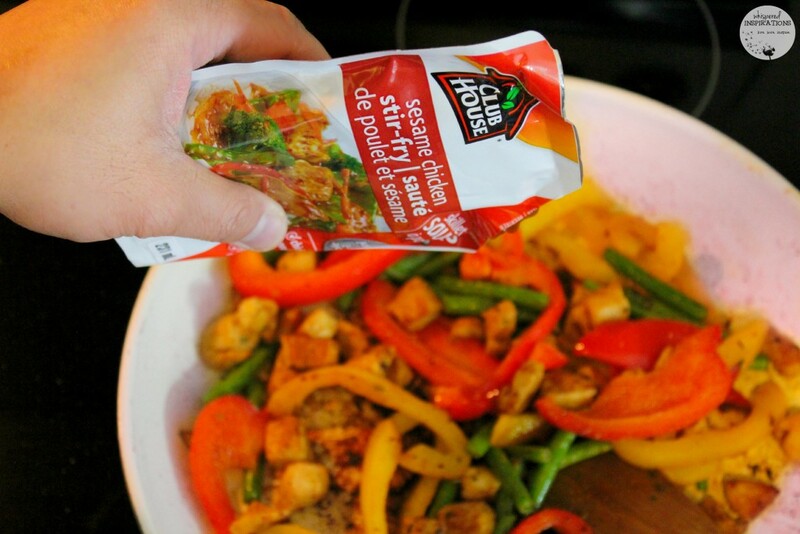 Do you enjoy stir-fry in your home? Previous Post: « Grill w/ the T-fal OptiGrill: Pepper Jack Bacon Guacamole Burger Recipe! What a nice yummy meal. Haven't tried this one from Clubhouse yet, but it will be put on hubby's list for the next grocery shop. Thanks for sharing. Oh yum! I make stir-fry a lot in my house but I have never used a store-bought sauce before. It would certainly cut down the amount of work required. Every flavor you listed sounds delicious. I must try this!